Sydney-based CHAMP Private Equity is poised to make a rare investment in Australia’s growing defence manufacturing SME sector, as industry growth provides attractive business opportunities. In a first for Australia's defence industry, CHAMP Private Equity will take a majority stake in Victorian-based Marand Precision Engineering, alongside the defence SME's founding Ellul family. The terms of the transaction are confidential. BAE Systems' Hunter Class Future Frigate – worth $35 billion to provide nine anti-submarine warfare frigates. David Ellul, executive chairman of Marand, said, "Over five decades, Marand has evolved from a machine tools and equipment supplier to the automotive industry to being recognised as Australia's leading precision engineering company and Australia's largest supplier into the F-35 Joint Strike Fighter program. We consider CHAMP to be a fantastic custodian of the business, who will help ensure Marand maintains its innovative culture and reach its full potential." The company first became involved in the F-35 Program in 2002 and is now an established supplier of F-35 vertical tails, providing a range of specialised, precision machined components for the fifth-generation fighter aircraft. Australian-produced tails are now on the aircraft of several program partner nations, including Australia. The company's involvement with the F-35 program has seen an expansion of its Australia-based capabilities, with the opening of a state-of-the-art 'vertical tail manufacturing facility' in January 2018 that supports an additional 44 full-time positions. By December 2016, Marand had received one-third of the Australian contracts in the F-35 program. Marand currently employs more than 250 people across Australia, 180 of whom are located at the company's Moorabbin site, and 33 in the vertical tail team. Following the successful delivery of the company's 50th vertical tail to schedule with no customer quality issues, Defence Minister Christopher Pyne said, "Through its partnership with BAE Systems PLC, and with the support of its Australian and European supply chain, Marand has delivered its 50 conventional take-off and landing vertical tails all to schedule and without a single customer quality issue." 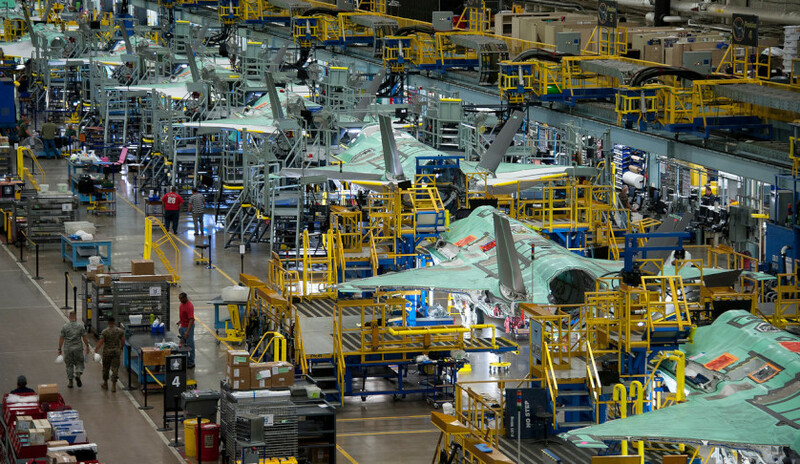 Marand’s implementation of a fully integrated F-35A vertical tail manufacturing capability culminated in the installation of a precision milling machine, which is used to machine products to meet strict quality and capability requirements. Lockheed Martin Australia chief executive Vince Di Pietro, AM, CSC, told Defence Connect at the time, "Lockheed Martin is immensely proud of our partnership with Marand and we extend our congratulations on this terrific achievement. We are proud of our partnerships with Australian industry which continue to provide the opportunity to apply their best of breed technology on the world stage." Additionally, Marand will also be responsible for the design, manufacture and integration of a specialised integrated gas turbine enclosure system for the Rolls Royce MT30 gas turbine, MTU diesel generators on the Royal Australian Navy's Hunter Class future frigates. Rob Madders, general manager of Rolls-Royce Naval Marine Australia and New Zealand, echoed Di Pietro's comments, telling Defence Connect in mid-2018, "We’re delighted to announce that Marand is our preferred industry partner for the manufacture of the integrated MT30 gas turbine enclosure. As the latest member of our global supply chain, Marand becomes an integral part of our rapidly growing MT30 market providing future export opportunities on worldwide naval programs." Rohan Stocker, CEO of Marand, welcomed the partnership, saying, "This is a wonderful opportunity to facilitate further growth in the business. Marand's innovative engineering, advanced manufacturing and sustainment capabilities will continue to add value to our customers and we are excited by the prospect of working with CHAMP to take the business to the next-stage in its development." CHAMP is believed to be attracted to the lucrative investment opportunity as a result of the government's $200 billion investment in Australia's defence capabilities outlined in the 2016 Defence White Paper, Integrated Investment Plan and subsequent industry development plans, which establish Australian sovereign industrial content and capability as key drivers for supporting Australian defence capability. In addition to the company's involvement with Lockheed Martin and the F-35 program, Marand designs, manufactures and exports products to defence industry primes including Boeing and BAE Systems, with additional commercial contracts including mining giants BHP and Rio Tinto rounding out their portfolio of work.